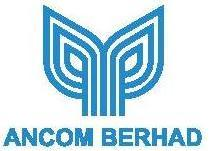 Number of Shares: 240 M.
Ancom Berhad, through its subsidiaries, is engaged in the manufacture and trade of agricultural and industrial chemicals primarily in Malaysia. It also provides various products and services to oil and gas industry; logistic services, including ship-owning, ship-operating, transportation, container haulage, bulk cargo handling, chemicals warehousing, and related services. In addition, the company is engaged in providing information technology; sale of computer hardware and software products; manufacture and marketing of polymer products and trade; contracting and marketing of electrical engineering products. Further, it involves in the manufacture and marketing of metal roof tiles; provides digital and outdoor advertising media space; and general trade of media space in the airport, baggage trolleys, and signages. Additionally, the company engages in the trade, ,providing and contracting of electrical engineering products and system integration, as well as environmental and hygiene protection solutions. In addition, Ancom Berhad is involved in the manufacture and marketing of sealants and adhesive products; trading of gardening products; providing management services; providing business to business exchange portal services, portal development services, web and multimedia design and other related services; dealing and subletting of land; call centre services; and also promotion and organizing of motor sports, as well as buying, selling, and dealing in various motors. It also operates in Singapore, the Philippines, the People's Republic of China, Hong Kong, Australia, Indonesia, the Middle East, Europe, Thailand, Africa, Vietnam, Sri Lanka, the United States, and Japan. The company is based in Petaling Jaya, Malaysia.